Several years ago, a little girl growing up with her big brothers in a farm town suburb of Kansas City met a horse. 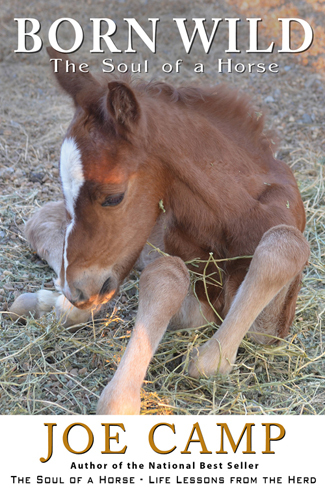 She would tell stories of the part-Arabian, part Shetland for years. How he used to be an entertainer of children in the big city. How her horse knew that one neighbor girl was suitable for bucking off his otherwise hospitable back. There were many tales of how much the fortunate horse named Lucky loved the fortunate little girl that rode him. This lover of horses is my wife Dorothy Joann. She is the kind of person to whom Joe Camp has dedicated his new book. As a young girl she would not know this author-trainer. He did not come along until years later after creating Benji, the beloved canine of movie and book fame. But Dorothy Joann and Joe share a love for horses and what horses teach us, while we other humans only think we are teaching them. 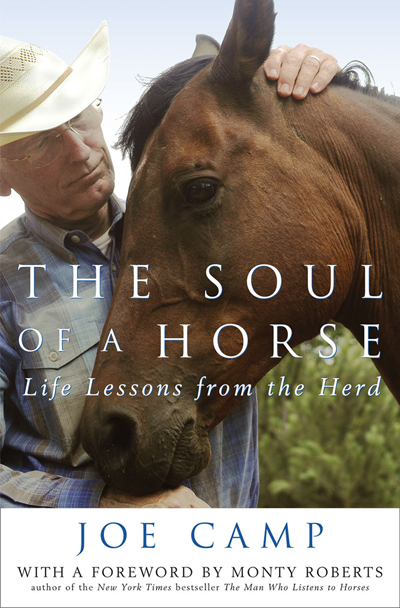 To say too much about Camp’s compelling book The Soul of a Horse: Life Lessons from the Herd (Crown Publishing) would be to spoil much of the beauty and simplicity of the story. It is about how to train horses, and love and care for them. That’s what the imprint from Harmony Books claims. But that kind of summary, based upon the main title, is deceptive. Yes, this is a warm, cleanly-written and simply but powerfully-drawn book about how to understand and raise horses. But it is so much more that it deserves a voyage of discovery when the reader has plenty of time to ponder how things fit together, how we learn, why we do what we do, and how much caring and patience outweigh discipline and over-direction. He unfolds his love affair with horses gradually, telling how he and his wife Kathleen took in their first equine friend, then another, then another. The bulk of the book deals with what he learned and how transferable it is to humans, if we will listen: teaching and training with love, patience, understanding of individual worth, an absence of fear, an appreciation of different environments, a willingness to try and try again. Each animal is an experience, and the Camps learn something from them all. There are many lessons in the book, no matter what kind of herd you happen to be a part of and being a herd member does not mean you (oops, the horses) must lose all of your individuality. The tightly-written, simply-designed chapters often read like short stories that flow from the heart, not just from the corral. Along the trail the reader learns that barriers can be good things, even instructive; that not all creatures learn the same way; that affection gets better results than dictation. Chapters that deal with mistreatment and the unnecessary use of horseshoes also have a human connection. Unfortunately, Dorothy Joann did not have Camp’s book to study when she first mounted Lucky years ago, yet like the relationships described by Camp, she and Lucky learned to understand each other and operate as an affectionate unit. That’s not a bad lesson or two for anyone in the herd. Joe Camp knows dogs and did well as the creator and producer of Benji movies a few years ago. Joe Camp knows and loves horses, too. He went into seven printings with The Soul of a Horse–Life Lessons from the Herd, a mixture of autobiography, prayer, insight and horse and dog raising skills. Now from 14 Hands Press, Camp has produced The Soul of a Horse BLOGGED–The Journey Continues. Camp has a feel, a heart, a sense of perception that compels the reader to see the relationship between man and animal, between the physical and emotional forces that compete with each other to make life rewarding and motivating. Camp has become something of a master at telling us what can be learned from animals, in this case specifically horses, without making us realize we have been educated, and, that is, perhaps, the mark of a real teacher. There is another side to Joe and his wife, beyond the raising of horses. The book deals with life, death, love, caring and questioning. He has underlined again in a rather quiet way how much we can learn from the patience, perception and peace raising good horses requires. In reference to the latest book, Camp writes, “This book is truly the continuation of our learning journey.” He says that discovering the mysteries of the horse is a never-ending journey, but the rewards are an elixir. The soul prospers from sharing, caring, relating and fulfilling. Nothing can make a person feel better than doing something for another being. Not cars. Not houses. Not facelifts. Not blue ribbons or trophies. And there is nothing more important in life than love. Not money. Not status. Not winning. Try it and you will understand what I mean. Apply it to your horses, and your life. If you want to continue to believe that Benji the movie was all about a cute little dog, go ahead… or that Camp’s tales are simply about how to raise horses. But remember about why he writes “horse books.” Then, perhaps, you will understand not just what the soul of a horse is but the soul of a man named Camp. He or she must have been referring to Who Needs Hollywood. If you want or expect a namedropping foray through Tinsel Town, or a nice cute tale about dogs by the guy in 1974 who forged the first Benji movie almost with his bare hands, you won’t be too disappointed as author Joe Camp does throw in a few names and battles with stereotypical Hollywood forms and other more conventional devices. But the Hollywood glamour days are almost secondary, the theatrical drama virtually anti-climactic. In a strange, strong, compelling sense, the book is not about the making of a Hollywood movie. It is about faith….having faith in what you can do, in hanging on. It also is a love story, for Joe’s first wife Carolyn, a college sweetheart who died too young but believed in him and for his present wife Kathleen. It is about strength and memories and family and remembering what his dad taught him about talent and perseverance long before he approached movie making. It is about the importance of little things like trust, observation, caring, really observing, questioning, mentoring, and doing something one believes in with someone one cares about, not just making money for the sake of the coins collected. It is not a pompous, presumptive, egocentric piece about success on the surface but more about feeling and finding and forming. Camp’s previous best seller, The Soul of a Horse used a similar approach: horse training as a way to explore the real human soul. “Hollywood” begins with the account of fledgling ad-agency-types in Dallas, who more or less led by Camp, believed in themselves. They hung in there, they honed their craft. Benji (inspired by one of Camp’s pets) and other ideas for stories kept them going. It was not easy to sell an unconventional dog story or to convince others that the dog could act and draw in others with his warmth–but that dog did. Sometimes, we literally have trouble seeing things from others’ points of view. It was hard to convince potential backers that Benji could act, that he was the star. A Dallas newspaper reviewer never mentioned the pooch when on the set to do a story; “big people” had to be the star.” Camp, however, finally sold the idea that emotions and feelings can be transmitted and revealed via a small canine. Camp admits to having misjudged himself and the human spirit a few times since that first movie down in Texas or his first motivating, supportive talk with his dad. The conscientious reader wanting much more than the typical Hollywood celebrity story need not despair or search any longer. He or she will find it in what Camp has written.